An average of 2,600 vehicles travel to and from the Boise area on Idaho 21 each day. Photo credit: Idaho Department Of Fish & Game / AP. Idaho Fish and Game wildlife cameras have captured images of deer and elk passing under the highway, as well as a mountain lion, coyotes, foxes and quail. Ed Bottum, a wildlife habitat biologist who has worked for Idaho Fish and Game for 25 years, recalled seeing a huge amount of blood on the highway after a crash a couple of years ago. It was the result of a motorcycle colliding with a deer — the pregnant doe was split in half. The motorcyclist spent the night at a Boise hospital but didn’t suffer any life-threatening injuries. 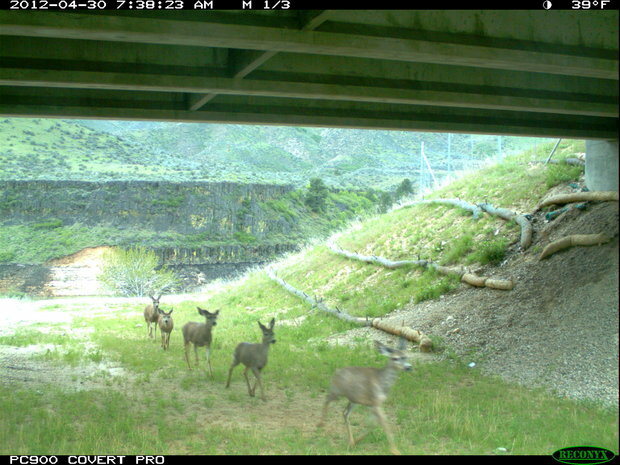 To reduce such collisions, Fish and Game biologists worked with Idaho Transportation Department officials to create a safe passage under the highway — Southwest Idaho’s first wildlife underpass. The numbers represent a minimum count, because sometimes carcasses are removed by animals or passing motorists. A law passed earlier this year makes it legal for people to pick up roadkill along Idaho highways; those who do so are required to notify Fish and Game.